The United States will increase financial pressure on Iran with the "strongest sanctions in history," after Washington withdrew from the 2015 nuclear deal with Tehran, Secretary of State Mike Pompeo said Monday. 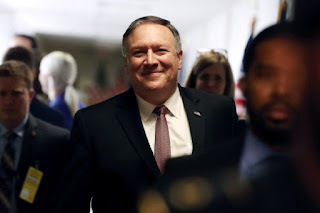 "We will apply unprecedented financial pressure on the Iranian regime, and the leaders in Tehran will have no doubts about our seriousness," Pompeo said in his first major foreign policy speech since leaving the leadership of the CIA to head the State Department. "The sting of the sanctions will only become more painful if the regime does not change the course of the unacceptable and unproductive path it has chosen for itself and for the Iranian people," he added, in an address at the conservative think tank Heritage Foundation. "Iran will never have any more carte blanche to dominate the Middle East," he said in describing the new US strategy toward the Islamic regime, which includes twelve harsh conditions in Washington for any "new agreement" nuclear. Pompeo has said that the United States would lift its sanctions if Iran put an end to its ballistic missile program and stop intervening in regional conflicts, from Yemen to Syria. "We will detect the Iranian operatives and their Hezbollah representatives that operate around the world and we will crush them," announced Pompeo. "Iran will be forced to make a decision: fight to keep its economy afloat in the country or continue to waste precious riches in fights abroad, it will not have the resources to do both," he assured. US President Donald Trump believes that the original 2015 agreement with Iran, also signed by the United Kingdom, China, France, Germany and Russia, was not strict enough in its demands on Tehran, and now wants the rest of the signers support their hard-line strategy. "In the strategy that we are announcing today, we want the support of our most important allies and partners in the region and throughout the world, not only I refer to our friends in Europe," said Pompeo. The secretary of state has also warned European companies that they have relations with Iran, violating the sanctions of the United States, which will be "forced" to render accounts. The restoration of US sanctions will force European companies to choose between investing in Iran or trading with the United States. Actually, there is no other option: European companies can not afford to leave the US market. For now, the European Union is trying to persuade Iran to remain in the 2015 agreement, even without Washington's participation.